Botanical illustrations that include plant habits and enlarged floral structures are usually fairly easy to decipher, even without the accompanying text. But sometimes a 19th or early 20th century work may include a set of diagrammatic marks that are quite distinct from the rest of an otherwise life-like drawing. Many illustrations of that time included a floral diagram, a sort of visual shorthand used to indicate the various parts of the flower and their relative position to each other. These diagrams are similar in concept to an architect’s floor plan—a cutaway of a building that shows only the spatial relationships of rooms, doors, windows, and other physical features. The floral diagram shows the arrangement of the flower’s structures in a single plane. Unlike the architect’s plan, the floral diagram gives no indication of overall shape of the flower, as the arrangement of structures occurs within a stylized series of concentric circles. In order to get a complete understanding of the flower’s shape, a longitudinal section (a flower sliced in half vertically) is necessary to show the size and form of the parts depicted in the diagram. While floral diagrams aren’t commonly included in contemporary botanical illustrations, they were once very important to document plant morphology, appearing in the early part of the 19th century in botany texts and used as a teaching tool. The methodology and symbols were standardized in 1875 with August W. Eichler’s Blüthendiagramme , an extensive work that formed the basis for Eichler’s system of taxonomy. Today the use of floral diagrams continues in the study of plant morphology and botanical systematics. The botanical illustration shown here is by Charles Edward Faxon ( Silva of North America , Vol. 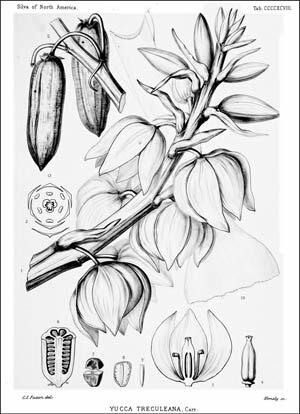 10, by Charles Sprague Sargent) and includes both a longitudinal section of the flower of Yucca treculeana and the corresponding floral diagram. These two components of the drawing are shown separately side by side and labeled to indicate how the floral structures appear in the floral diagram. 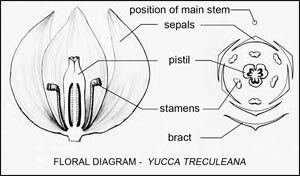 Note that the complete illustration shows the bract and stem, structures that do not appear in the longitudinal section of the flower. This appeared in the January 2016 issue of the Desert Breeze, the monthly newsletter of the Tucson Cactus and Succulent Society.